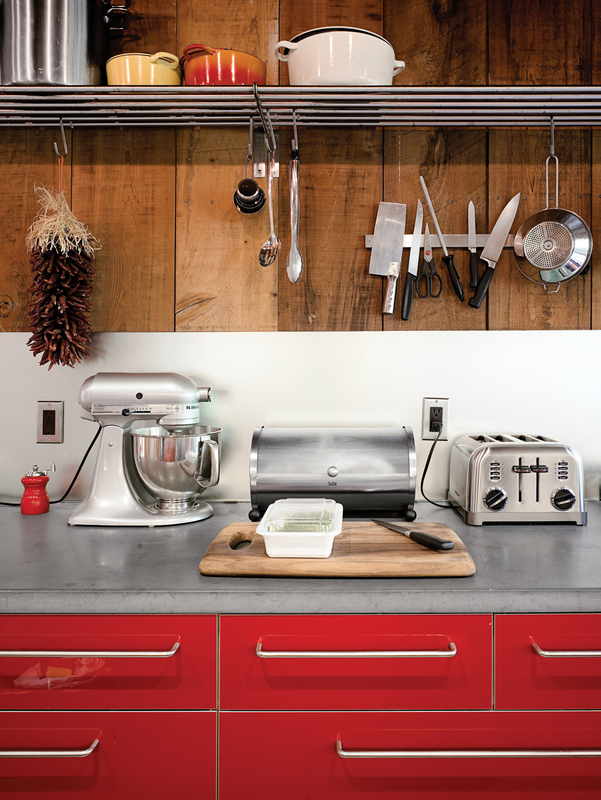 A collection of some of our favorite kitchen renovations from our archives. Now rented out as an office/retail space, the lower level of this San Francisco Victorian renovation contains a kitchen, which is fitted with Ikea lamps and steel shelving by resident Christi Azevedo. For the flooring she glued down fiber-cement HardiePanel siding more commonly used for building walls, both because of its resemblance to concrete and its price of one dollar per square foot. Read the full article here. The eye-catching kitchen cabinets behind Cat Macleod and her daughter, Celeste, were custom-built in lemon Liri Laminate by Amerind. The island bench is made from the same alpine ash used on the floor and the stairs all the way up to the master bedroom. Read the full article here. The floor-to-ceiling storage and simple finishes in Scavolini's Reflex kitchen leave plenty of room for culinary art to be the primary flourish within the spare space. For color lovers, lacquered options are available in brighter hues. On the main floor of this open-plan home in Sydney, the kitchen island is like architect Brian Zulaikha's own version of a Donald Judd sculpture: minimal, freestanding, and geometric. Read the full article here. Vintage kettles and a wide-ranging assortment of pots and pans sit above kitchen cabinets from IKEA in this renovated loft in Los Angeles's Chinatown. Read the full article here. The walnut cabinets in the kitchen of this 1878 San Francisco original, which update and warm the space, were designed by Nilus de Matran and fabricated by George Slack. Read the full article here. A custom recycled-Douglas fir table by VanEyk Custom Woodworks is the heart of the living-dining room in the so-called "Scrap House." The double-height wall is clad in the same steel that wraps the exterior. Read the full article here. Almost every element of the interior of Blake Dollahite's modest Austin renovation—from the kitchen cabinetry to the art on the walls—was created by Dollahite himself. Read the full article here.